If you never heard of Larry, Moe, and Curly – then you have had a deprived childhood. Those lovable clowns could do no right regardless of the situation, yet always avoided major catastrophes. 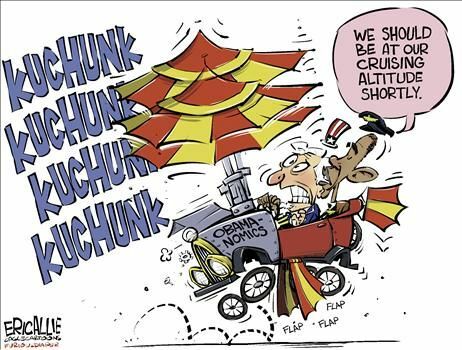 The Modern Day Obama Economic Stooges follow a similar theme of not being able to get economic policy right for Barry O. Unfortunately, their goof ups have placed the world economy in the proverbial dog house. When Barry O came riding into the White House showing his Alfred E Neumann smile, he brought the executive knowledge and skills of a stable boy. Obama had never run a company or had any related executive experience to grace the White House lawn. As such, when important decisions came about as putting together an Economic Team to help the nation, Barry O was clueless. So what is a liberal Democrat to do? Why recycle former Clinton advisors for starters, you silly wabbit! Bring in former Clinton advisors Larry Summers, Peter Orzag, and Tim Geithner to get the pot simmering. All three had the advantage of having a conservative (somewhat) Congress reign in their idiocy during the Clinton years, so they had images of success bouncing around in their heads coming into the Barry O Administration. Then enter another liberal econ wonk in Christina Romer and you have the foundation for what has become the worst economic policy team in American history that has ushered in the worst recession since the Great Depression. On the surface they all appear to be intelligent, well-educated folks in various fields of economics. They all attended only the finest in Harvard, Princeton, MIT, Dartmouth, etc. ; so it was presumed that they had some intellect into their jobs. However, when you delve into their history, it is apparent from the start that this group all subscribed to large government growth and more taxes as some basis for their economic policy. This is the current recipe for disaster we all taste in our mouths. Geithner has a fairly impressive financial resume being head of the Fed in NY before taking his current gig and he worked for Summers during the Clinton years in the Treasury. He also spent considerable time in Japan and China and served in the US Embassy in Japan in the 90’s. During that time, Japan went through one of its worst recessions every and showed why big government did not work. Apparently Geithner paid no heed to that lesson – he helped usher in TARP, Obama’s tax policy, and the Auto Industry fiasco. While his head is not yet on a platter, I predict this tax cheat to be gone before April 15, 2011. Romer is a classic monetary policy know-nothing. Some of her great work was why US monetary policy accidentally got the US out of the Great Depression. Forget about that little incident called World War II that pulled the US manufacturing sector out of the toilet. She theorizes on “exogenous” tax increases to reduce “inherited” budget deficits. She is gone from the Council of Economic Advisors but landed on the Presidents Economic Recovery Advisory Board. Try to guess what she will preach. Orzag, one of the Clinton re-treads, headed the Office of Management & Budget until July. He also was at the Congressional Budget Office in 07 & 08 and came to the OMB with ties to get “favorable” ratings on Congressional Budgets. You know, those trillion-dollar ones. He co-authored a paper titled “Implications of the New Fannie Mae and Freddie Mac Risk-Based Capital Standard” with Nobel Prize winning economist Joseph Stiglitz in 2002 in which they inferred that “on the basis of historical experience, the risk to the government from a potential default on GSE debt is effectively zero”. Wow, he missed that one by a tad! Summers is the one that really makes you wonder what in the hell was Barry O was thinking. Summers is not the typical liberal Dem of big government and big taxes. As a matter of fact, Summers has been a proponent of lower corporate taxes and capital gains taxes. However, Summers is one of the guys that can go too far in the other direction of risk versus reward and really muck things up. In 1998, Summers was Deputy Secretary of the Treasury under Clinton. He gave testimony to the Commodity Futures Trading Commission before Congress back then on a new concept called “derivatives trading”. You remember this term – it is what AIG and other financial institutions were playing when they all crashed the world economy. Summers testimony before Congress was “…the parties to these kinds of contract are largely sophisticated financial institutions that would appear to be eminently capable of protecting themselves from fraud and counterparty insolvencies”. In other words, this guy had a key role in forming the policy that allowed the worlds monetary goliaths to play financial Russian Roulette. Then Barry O comes in and puts him at the head of the economic table by making him the Director of the National Economic Council. Thank God he is gone at the end of the year. So what does all this mean? Well, if the Mid Terms go as thought, the big budgets and spending will hopefully tone down in Congress. However, Barry O is going to be looking for a new Economic Advisory Board to rely on to get him out of this financial nightmare he created. With his current track record, God only knows who he will tap on the shoulder. The Constitution celebrates liberty, prosperity, and opportunity. Over 234 years ago under the divinity of God, our Founding Fathers came together to draft the defining instrument of freedom through limited government, personal responsibility, and the opportunity that became America. At that specific point in time, it was the states that breathed life into the federal government – not the other way around. America stood for exceptionalism, individualism, entrepreneurship, and the essence of capitalism. We developed the strength in military might that became the envy of the world. And yes – America became the center of the known universe. This was possible because of the foundation laid in the Constitution. But the Constitution was also drafted to exposure and defy tyranny. Somewhere along the line, we began to freely give away rights our Founding Fathers penned in the Constitution in the name of patriotism. After WWII, we gladly offered up our rights in the name of service to the country. However, our patriotism was abused and led to an infestation of Marxist at all levels of govt. What started out as an inconvenient political movement 60 plus years ago has ended up placing the first communist in the White House. Now, when “Hope & Change” means “I hope Obama changes real soon” and the very document we celebrate is being shredded before our eyes, we are also witnessing a re-birth in what the Constitution stands for. Copies are given out everywhere; people now read the document that so much blood and love has been spilled for. The Constitution has by its very existence given the masses the vision and path of how to re-gain our country. The Constitution has awakened the Spirit of America. It has once again been rekindled and it is the spirit that binds us all. Its is the pang you feel in your heart when you sing the Star Spangle Banner. It is the swelling of pride in your chest when you remember the brave souls who sacrificed their lives on 9/11/01. It is the reason patriots all over the United States celebrate liberty and the defiance of tyranny. That a coalition of the conservative have committed to make peaceful change at the ballot box to reclaim our heritage draws its very birth from the document. That is a true act of homage to the Constitution. It is more than overdue that we make a national holiday to celebrate and revere the very document that grants the freedoms we seek and fight for. Everyone has their memory of where they were and what they were doing when the news came out of the planes crashing into the Twin Towers. I happened to have been heading to our office in Arlington, Texas when the news first broke over the radio. I had planned on taking my mother to lunch that day. September 11 was also her birthday. Those plans changed rapidly. As the news kept coming in and it started to become clear that this was not a series of freak accidents, but a planned attack against our great nation, my gut started twisting. Was Texas next on the list? Lord knows we have enough targets. I called my wife to have her get home and to see if she could get our oldest out of school. I started going through a systematic checklist in my head of supplies we had at the house. Was this really happening? When I reached the office our staff was pale, forlorn, and silent. Fax and email communications from every insurance carrier we dealt with sent blast messages regarding the incident, uncertainty of coverage, and office closings for the balance of the week. Like most financial companies, most insurance companies are housed in some form of office tower. We changed the voice mail and closed down. Like most of the nation, I saw the towers fall. I saw the damage at the Pentagon and the story of another plane in Pennsylvania. I heard the name of Osama Bin Laden and Al Qaeda and all the history and kept asking myself “how in the hell did we allow this to happen?” When the schools came off lockdown and I had my son home, our home went on lockdown. By sheer luck we had been grocery shopping the day before, plus I am a camping nut who always has a plethora of canned goods. It was time to hunker down and see what was going to happen. No more attacks came. As I watched the days events over and over again on the tv, I knew our country would never be the same again. I was not sure what that meant at the time, just that feeling in the pit of my stomach. I thought of my 3 kids, all just babies at the time, and the one on the way Carol was pregnant with. The new one was not due for another 6 weeks, but the trauma of what was happening threw my wife into labor. This was not a good thing – Carol is 4 foot 10 and weighed all of a 105 lbs pregnant and all 3 prior kids were C Section. The docs tried to different drugs over a week to get her back to normal, but my 4th child was born 1 week to the day after the attacks on September 18, 2001. Darren Gene Yancy, Jr , or Gene as we call him, took the 5 weeks early delivery in stride I am happy to say. My wife Carol came through like the trooper she was and handled the C Section in stellar fashion. I was still at DEFCON 1 and damn near having a nervous breakdown over bringing my 4th child into the world at war 5 weeks ahead of schedule. Nine years later and we all know the history – Bush kicked the crap out of Al Qaeda and made our country a safer place. Whether we all agree on the tactics used or the theater of play where the response occurred, a response was required and America gave one. We may not have been as popular as pre-9/11, but the rest of the world feared having America coming after them. In retrospect, the Bush Administration may have done too good of a job. Americans got comfortable and complacent again and it opened the door for the Democrats in 2006. Remember kids, the Democrat loons have been running the Congressional Asylum since 2006, not 2008. Now we have Barry O and the Obamanites who cannot even use the word “terror”. Our President apologizes for our great nation and kisses the backside of our enemies. Obama does not even qualify for the term “Paper Lion” – he is more like a declawed cat. What moron makes his first move to shut down the very place where the scum of the world is secure and observed without so much as a plan of where to go with these creeps. Alas, this is the world of Mr Pollyanna – our current President. The best thing we can do to honor those that died in the attacks and those that have died since protecting your babies and mine is to get back to the polls and vote some sense back into Congress. I want America effective, independent, prosperous, and well armed just to mention a few items. I am not concerned about being everyone’s friend. Oh, and if you want the US to play world police unit – pony up to the bar and pay your tab. America is weathering a new attack right now from the liberals in DC. In less than 2 months we begin the process of protecting and rebuilding our great nation again. If you have any doubts, go and find a re-play of the attacks and remember how you felt. Think of the financial ruin the liberals are trying to inflict upon us now. If successful, we will not be able to afford to protect our great nation and will be subject to more attacks on US soil. Add all of this up and ask yourself the question – Are you better off now with the libs in control ? If the answer is no (God help you if its yes), then remember 9/11/01 when you vote on 11/2/10. When you log onto the website www.america.gov you might be a bit surprised at what you see. I must confess that before Barry and the Obamanites came to power I rarely looked into government websites. Now I make it a habit. The website puts forth the following message of why the site exists “This site delivers information about current U.S. foreign policy and about American life and culture. It is produced by the U.S. Department of State’s Bureau of International Information Programs. Links to other Internet sites should not be construed as an endorsement of the views contained therein.” OK, sounds simple enough. My personal thoughts are that if it is “AMERICA”.gov then it should be about America. Talk about the culture and heritage, our great beauty of the nation, as well as promote each of the states and what residency in this great nation can offer. Throw in a little foreign policy. However, my idea of what the use of the name should be and what this site actually promotes are two different topics. If you go there on any day, it becomes clear that this site is devoted to Obama’s Foreign Policy and capitulation to the UN and the rest of the world that is jealous of the US. Climate Change is one of 3 key topics rotating at the top of the site. I would have thought the scandal in 2009 in Copenhagen would have been enough to derail this train, but this Administration is chugging along like it never happened. Here is a good reminder of the scam world scientists in bed with the loons have been cooking: http://www.telegraph.co.uk/comment/columnists/christopherbooker/6679082/Climate-change-this-is-the-worst-scientific-scandal-of-our-generation.html. There is a tab for “American Life”, which one would hope would promote American Life. The first topic is US Government with breakdowns in the Freedom of Information Act, The Anatomy of a Jury, and how to contact the US Government at the click of a mouse. Wow, have I been living the wrong dream! There is a cultural tab that focuses on blacks, Native Americans, and Hispanics – as it should. However, a little background on those from Europe that discovered the nation and established it would not hurt either. The 3rd tab is on Education and Youth and the first topic is “Can Tolerance Be Taught”. You get the picture. The rest of the site is pretty much right out of the UN Playbook on Global Appeasement. Are there some topics on the site I agree with – yes. Water needs, we always need research & development in science and space, etc. However, one of the tabs on Development shows Oprah Winfrey Still Loves School. Really? Who cares? Oh, the US official policy is to rid the world of nukes. Nice idea Pollyanna, but Putin is feeling his commie roots again and is getting cozy with Chuckie Chavez down south. Do the words Missiles of October mean anything to this administration? Fifteen minutes to strike the heart of the US? The site also has links to several other official US Government websites, such as www.usa.gov, the EPA, ICE, NASA, etc. Just one bit of advice – read them on an empty stomach or you may have a negative reaction in your digestive system. Writers Note – this is purely plagiarized via cut and paste. I get way too many emails to count. I share this one in blog form because it is just darn true to ignore. Make a November to Remember and vote.- Darren. In just six months, on January 1, 2011, the largest tax hikes in the history of America will take effect. They will hit families and small businesses in three great waves. In 2001 and 2003, the GOP Congress enacted several tax cuts for investors, small business owners, and families. These will all expire on January 1, 2011. The top income tax rate will rise from 35 to 39.6 percent (this is also the rate at which two-thirds of small business profits are taxed). The lowest rate will rise from 10 to 15 percent. All the rates in between will also rise. Itemized deductions and personal exemptions will again phase out, which has the same mathematical effect as higher marginal tax rates. Higher taxes on marriage and family. The “marriage penalty” (narrower tax brackets for married couples) will return from the first dollar of income. The dependent care and adoption tax credits will be cut. The return of the Death Tax. top death tax rate on estates over $1 million. A person leaving behind two homes, a business, a retirement account, could easily pass along a death tax bill to their loved ones. Think of the farmers who don’t make much money, but their land, which they purchased years ago with after-tax dollars, is now worth a lot of money. Their children will have to sell the farm, which may be their livelihood, just to pay the estate tax if they don’t have the cash sitting around to pay the tax. Think about your own family’s assets. Maybe your family owns real estate, or a business that doesn’t make much money, but the building and equipment are worth $1 million. Upon their death, you can inherit the $1 million business tax-free, but if they own a home, stock, cash worth $500K on top of the $1 million business, then you will owe the government $275,000 cash! That’s 55% of the value of the assets over $1 million! Do you have that kind of cash sitting around waiting to pay the estate tax? Higher tax rates on savers and investors. The capital gains tax will rise from 15 percent this year to 20 percent in 2011. The dividends tax will rise from 15 percent this year to 39.6 percent in 2011. These rates will rise another 3.8 percent in 2013. Thanks to Obamacare, Americans will no longer be able to use health savings account (HSA), flexible spending account (FSA), or health reimbursement (HRA) pre-tax dollars to purchase non-prescription, over-the-counter medicines (except insulin). cruel and onerous: parents of special needs children. There are thousands of families with special needs children in the United States , and many of them use FSAs to pay for special needs education. Tuition rates at one leading school that teaches special needs children in Washington , D.C. ( National Child Research Center ) can easily exceed $14,000 per year. Under tax rules, FSA dollars can not be used to pay for this type of special needs education. The HSA (Health Savings Account) Withdrawal Tax Hike. This provision of Obamacare increases the additional tax on non-medical early withdrawals from an HSA from 10 to 20 percent, disadvantaging them relative to IRAs and other tax-advantaged accounts, which remain at 10 percent. When Americans prepare to file their tax returns in January of 2011, they’ll be in for a nasty surprise-the AMT won’t be held harmless, and many tax relief provisions will have expired. The AMT will ensnare over 28 million families, up from 4 million last year. According to the left-leaning Tax Policy Center , Congress’ failure to index the AMT will lead to an explosion of AMT taxpaying families-rising from 4 million last year to 28.5 million. These families will have to calculate their tax burdens twice, and pay taxes at the higher level. The AMT was created in 1969 to ensnare a handful of taxpayers. Small business expensing will be slashed and 50% expensing will disappear. Small businesses can normally expense (rather than slowly-deduct, or “depreciate”) equipment purchases up to $250,000. This will be cut all the way down to $25,000. Larger businesses can currently expense half of their purchases of equipment. Taxes will be raised on all types of businesses. There are literally scores of tax hikes on business that will take place. The biggest is the loss of the “research and experimentation tax credit,” but there are many, many others. Combining high marginal tax rates with the loss of this tax relief will cost jobs. Tax Benefits for Education and Teaching Reduced. The deduction for tuition and fees will not be available..
Teachers will no longer be able to deduct classroom expenses. Coverdell Education Savings Accounts will be cut. Employer-provided educational assistance is curtailed. The student loan interest deduction will be disallowed for hundreds of thousands of families. Charitable Contributions from IRAs no longer allowed. Under current law, a retired person with an IRA can contribute up to $100,000 per year directly to a charity from their IRA. Now, your insurance will be INCOME on your W2’s! One of the surprises we’ll find come next year, is what follows – – a little “surprise” that 99% of us had no idea was included in the “new and improved” healthcare legislation . . . the dupes, er, dopes, who backed this administration will be astonished! Starting in 2011, (next year folks), your W-2 tax form sent by your employer will be increased to show the value of whatever health insurance you are given by the company. It does not matter if that’s a private concern or governmental body of some sort. If you’re retired? So what… your gross will go up by the amount of insurance you get. You will be required to pay taxes on a large sum of money that you have never seen. Take your tax form you just finished and see what $15,000 or $20,000 additional gross does to your tax debt. That’s what you’ll pay next year. For many, it also puts you into a new higher bracket so it’s even worse. This is how the government is going to buy insurance for the 15% that don’t have insurance and it’s only part of the tax increases. Not believing this??? Here is a research of the summaries…..
– Joan Pryde is the senior tax editor for the Kiplinger letters. – Go to Kiplingers and read about 13 tax changes that could affect you. Number 3 is what is above. This contribution also counts toward an annual “required minimum distribution.” This ability will no longer be there. Tax credits for education will be limited.